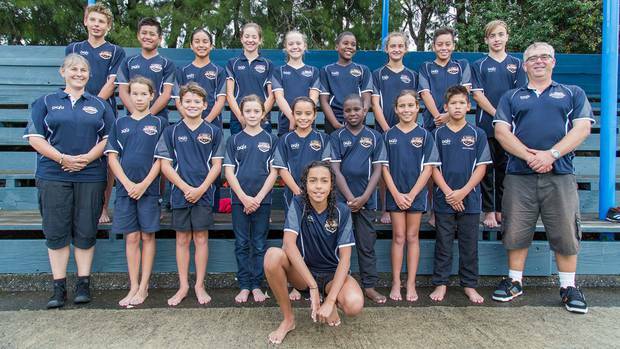 Swim Rotorua stole the show with a magnificent team effort at the AquaKnights Junior Festival for swimmers aged 12 and under. The event, held at the Rotorua Aquatic Centre at the weekend, attracted 355 of the best junior swimmers from Bay of Plenty, Hawke's Bay, Poverty Bay, Taranaki and Waikato. Swim Rotorua emerged victorious, crowned the AquaKnight champions with 5158 points and 42 medals. Leading the charge was 12-year-old Theo Harvey who produced an impressive haul of five gold medals, in the 100m, 200m, 400m freestyle and the 50m and 200m butterfly. Theo's best performance came in the 400m freestyle where he dominated from start to finish with a time of 4m 44.58s, qualifying him for national age group championships. Theo also took home four silver medals. Aaron Muchirahondo, 11, also claimed a bagful of medals. Aaron did the triple in his signature breaststroke races, winning the 50m, 100m and 200m events. His best effort came in the 200m breaststroke with a time of 3m 6.89s. Not content with that, Aaron also produced a swift 50m backstroke to grab another gold, plus four bronze medals. Rising star Kaia Joyce won eight medals. She managed the tough feat of winning silver and bronze medals in all the 50m events then went one better to win the 10-year-old girls' 200m medley race. Kaia's other top three placings came in the 100m medley, and 100m and 200m freestyle. Older brother Miki Joyce produced a quality race to take the silver medal in the 11-year-old boys' 50m breaststroke. Ngamihi Simpson gave it everything to secure 10 medals in the 11-year-old girls' age group. She grabbed the silver medal in the 200m backstroke, 100m butterfly, 100m and 200m breaststroke, and then another six bronze medals to demonstrate her ability to race any stroke at any distance. Lina Stahlhut produced a cracking series of performances in the 12-year-old girls' age group to take home four bronze medals in the 200m and 400m freestyle, 100m and 200m backstroke. Sam Trass showed he has an exciting future ahead, storming home to take an unexpected bronze medal in the 50m backstroke with a superb time of 34.84s. In the 4x50m mixed medley relay, Linda, Aaron, Ngamihi and Theo combined to take the silver medal behind rivals Comet Swimming Club from Gisborne. The other Swim Rotorua team members who performed admirably were Lizzie Avis, 11, Emma Balmer, 12, Naitarah Hunia, 10, Pheonix Hunia, 12, Ariel Muchirahondo, 8, Nikita Pola, 12, Ava Temain, 9, Stella Weston, 12, Taonga Wharekura, 11, and Dion Wright, 12. Head coach Alastair Johnson was "extremely pleased" with his team's showing. "Wow, everyone in the team stood up and raced their hearts out in every single event. We hoped that we could break into the top three clubs, but to take the champions title in such a dominant fashion is really exciting. "I have no doubt that this young group of swimmers will continue to grow and improve together which augurs well for the future. "We are a really close team, not just the swimmers who competed, but also with their teammates, their parents and of course our fantastic coaches Bronwen Radford and Claire Baylis. They both did such an amazing job in preparing the swimmers so that they could represent Rotorua in such fine style."